This eight night cycling holiday offers you a truly Provencal experience, taking in the lush countryside and mountain landscapes of beautiful Provence - the inspiration for many an artist and author, including Van Gogh, Cezanne and Picasso. Your cycle route explores the region's mediaeval towns and charming perched villages such as Gordes and Bonnieux, along with sprawling vineyards, curious caves and castle ruins, all against a vibrant backdrop of colour - think rich ochre, delicate lavender and even white cherry blossom in spring. With a number of small wine producers dotted along your route, you can stop and taste some of the region's local wine in between cycles. Your week starts in the medieval town of Pernes-les-Fontaines, before taking you past pretty L'Isle-sur-la-Sorgue, at the foot of the Vaucluse plateau. Surrounded by the River Sorgue, this is a charming town to potter around, its narrow streets filled with quaint cafes, little antique shops, old bridges and water wheels, not to mention a bustling market every Sunday. You then move on to the town of Fontaine-de- Vaucluse, overlooked by crumbling castle ruins and home to the source of the River Sorgue. After following the Ochre Trail to explore the narrow streets and pastel-painted houses of mediaeval Saint-Saturnin-les-Apt, overlooked by sprawling castle remains and two C17 windmills, you freewheel down to the mediaeval town of Apt at the centre of the Luberon National Park. A greenway then leads you along the middle of the valley with views up to the famous perched villages of Bonnieux and Lacoste, and on through to sleepy Maubec.. Your week ends with a possible visit to Thouzon's impressive caves, carved by an underground river, before you head home from Pernes-les-Fontaines. You stay in a wonderful mix of hotels this week. Hotel l'Hermitage offers a relaxing stay in a C19 manor house with lovely grounds and a swimming pool; Mas de la Senancole in Les Imberts is your next stop, offering Provencal-style rooms, a heated outdoor pool and a spa with sauna, hot tub and massage room; your home in Apt is the cosy Hotel Sainte Anne, a small family-run hotel just across the river from the old town. Arrive at your 3-star hotel in Pernes-les-Fontaines. Relax with a dip in the pool or explore the grounds before dinner. Cycle alongside the Canal de Carpentras, before heading, via quiet country lanes and verdant vineyards, towards the 'island city' of L'Isle-sur-la-Sorgue, surrounded by the clear waters of the River Sorgue. 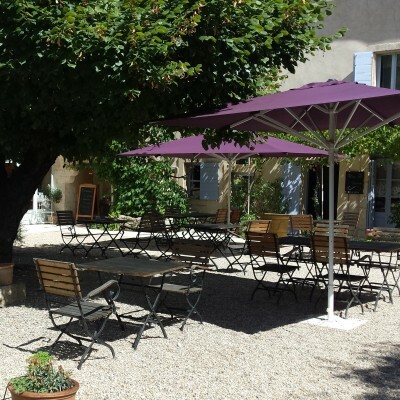 This popular town offers many riverside cafes and is a great place to stop for lunch before heading on to the charming, mediaeval village of Fontaine-de-Vaucluse. Visit the largest spring in France, or potter around the handful of quaint shops and cafes, before ascending to your first, stunning view across the Luberon Valley. You then descend, amidst vineyards and olive groves, to the village of Les Imberts, just below the famous perched village of Gordes. Walk or cycle to the famous, mediaeval perched village of Gordes today, to experience one of the best views there is over the Luberon - a patchwork of open plains, sprawling vineyards and olive groves. Explore the village and its castle and perhaps take a taxi (payable locally) up to the beautiful l'Abbaye Notre-Dame de Senanque. Guided tours are available in the afternoon, or pay an early morning visit for the chance to explore at your leisure. After breakfast, set out through the tranquil countryside and make the short climb up to Roussillon and the start of the Ochre Trail. Enjoy the views, and perhaps a morning coffee, before pedalling on to Gargas to visit the vast Ochre Mines of Bruoux, and enjoy a spot of lunch. You'll then follow quiet lanes past vineyards - perhaps stopping to taste and purchase some of the local wines - up to the perched village of Saint-Saturnin-les-Apt, before freewheeling down to the mediaeval town of Apt, famous for its crystallised fruits and traditional pottery. Today explore Apt's old town, wandering along the narrow alleyways to the ancient Cathedral of Ste Anne, which has its origins in Roman times (the lower crypt dates back to AD 1). In addition to the town's museums and the Maison du Parc du Luberon, there are also plenty of shops, cafes and colourful Saturday and Tuesday markets selling a range of locally grown produce and traditional Provencal arts & crafts. This morning your route follows a greenway (once an old railway track) alongside the River Calavon before crossing the Pont Julien, a stone bridge built in Roman times and an excellent picnic spot. Leave the greenway then to follow quiet lanes to the wonderful village of Bonnieux, passing Chateau la Connorgue en-route (made famous by Ridley Scott's film A Good Year starring Russell Crowe), where you can stop for a tasting. 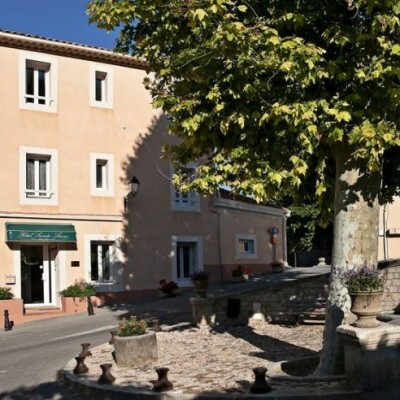 From the village you then head on through the centre of the Luberon with views up to the perched villages of Lacoste and Bonnieux, as you wind your way to Maubec and your hotel. Options today include circular rides to the pretty villages of Lagnes, Taillades and Robion. Alternatively, take a taxi ride (payable locally) to explore historical Saint-Remy-de-Provence to visit the old town, impressive Roman site of Glanum and the monastery of Saint Paul de Mausole where van Gogh lived during the period of such eternal masterpieces as The Starry Night. This morning you'll cycle past apple orchards to the small, mediaeval town of Le Thor on the banks of the River Sorgue before continuing to the hilltop town of Thouzon. Visit Castle Thouzon (an ancient fortified monastery) and explore Les Grottes de Thouzon, a 320m-long cave carved out by an underground river over 60 million years ago. After lunch, continue on to Pernes-les-Fontaines where you'll have time to explore the mediaeval old town and the numerous ancient stone fountains. Please see our Planning you holiday page for full details. This 19th century residence, transformed into a hotel, feels like an old family home. It is set amidst 2 hectares of grounds bedecked with fountains, many species of trees, and an orangery. The Hotel l'Hermitage is about 4km outside Pernes-les-Fontaines. The hotel also has a swimming pool in the heart of the property. Located in Les Imberts, just a few kilometres from the famous perched village of Gordes, with its mediaeval castle, and the Village des Bories open-air museum, is the Mas de la Senancole. Along with a garden and a heated outdoor pool, the property also offers guests a spa featuring a sauna, hot tub and massage room. Each room is decorated in the Provencal style and features air conditioning, tv and a minibar, some also have an outdoor seating area. Next door is the hotel's restaurant L'Estellan which serves regional dishes with a contemporary twist. Room upgrades: Room with Terrace or Roussillon Room. Terrace rooms feature direct access to the outside and have a small seating area with sun-loungers. 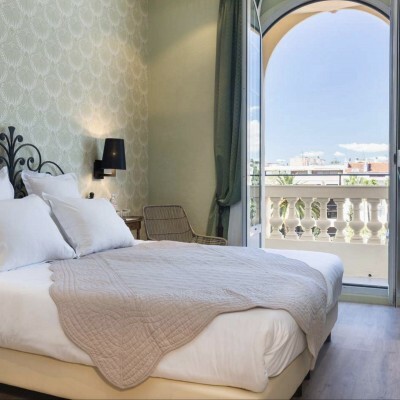 Ideally situated in a former C19 townhouse, quietly tucked away next to the old town in the authentic Place Faubourg du Ballet, is the Hotel Sainte Anne. This cosy hotel features just 7 comfortable, personalised rooms and the top floor overlooks the rooftops of the old city just across the river. Breakfast features home made breads and jams as well as fresh fruits and yoghurts. The hotel does not offer evening meals but as there are so many local restaurants to choose from, we have left your evening meal free. Room upgrades: Comfort Luxury Room or Junior Suite. Confort Luxury rooms are larger with small balcony. A former farm house, once owned by a duchess and set amid its own woodland in the peaceful south west of the Luberon, the Bastide du Bois Breant has been restored to provide a typically Provencal feel, offering traditional rooms with modern features overlooking a courtyard. 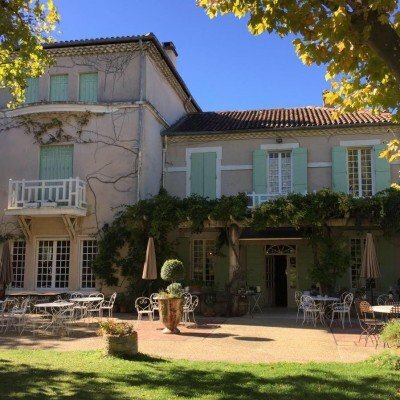 With a garden and a lovely swimming pool, the hotel provides an oasis of tranquility in close proximity to some of the most popular villages in Provence. Standard room type here is the Inspiration room, with upgrades available to Quietude and Plenitude rooms on request. Room upgrades: Quietude Room or Plenitude Room. Quietude room is larger and features a super king size bed or 2 single beds. The bathroom has a double wash basin, a bath and a shower. Plenitude is bigger again and has large windows opening onto the garden and a super king-sized bed. The bathroom features a shower and a stand alone bath tub. 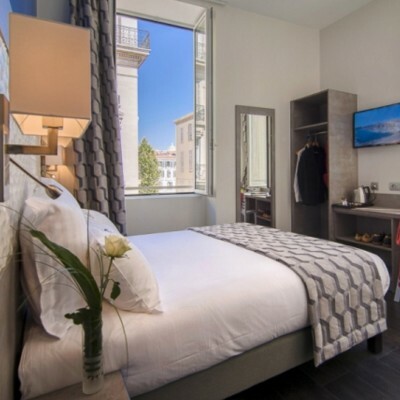 Situated by the well-known old port - which gives the hotel its name - the Hotel Carre Vieux Port is in the perfect location to make the most of this vibrant city. The hotel has cosy, modern rooms with contemporary bathrooms and fixtures. There are plenty of restaurants near the hotel for you choose from for dinner. 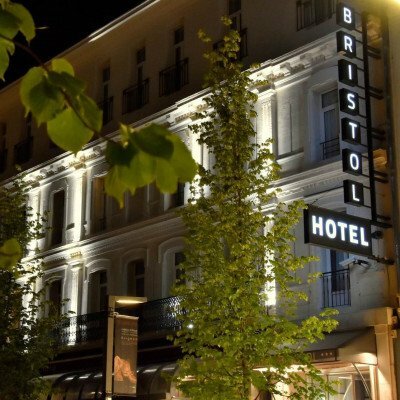 Situated just inside the city walls and a stone's throw from the station, the Hotel Bristol sits in the historic centre of Avignon. It is located along the main street which leads to the city's main attractions; the Place de l'Horloge, the Palais des Papes and the famous Pont d'Avignon - all within a 15 minute walk. It is also ideally located to do some shopping! Inside, the lounge with its thick carpet and leather armchairs provides a cosy atmosphere. The rooms are modern and offer a variety of bed and bathroom options. There is no restaurant here but with such a huge selection right on the doorstep, you only have to step outside to explore the numerous possibilities. Le Grimaldi has 46 individually decorated rooms all equipped with air-conditioning, satellite tv, minibar, safe and hairdryer. Ideally situated in the heart of Nice the hotel is just three minutes' walk to the pedestrian area of the city with its vast choice of bars and restaurants, 10 minutes walk from the Promenade des Anglais and 15 minutes walk from the Old Town. Transfers included from Avignon TGV train station at 13:18, and back to Avignon TGV train station at 11:45. Barry and I throughly enjoyed our experience in Provence cycling with Headwater. The only difficul thing was to get a good cup of coffee! Our cycling holiday in the Luberon was typical Headwater style. Friendly rustic hotels, minor road routes, places to visit, great scenery and great local food and wine. Other cyclists on the same route were great company when we bumped into them. We had a lovely holiday. The weather was perfect, the area very beautiful and interesting and the hotels were good, but we found the bikes very heavy and poorly geared for the fairly hilly nature of some of the routes. A lovely area to holiday, with beautiful scenery, and great hotels (we particularly liked the Mas and the Bastide for their settings, and the welcome from the owner of the Hotel Ste Anne was extremely helpful and welcoming - she had lots of ideas about what to do and see around Apt, and gave us details of rides in the area). Our first reps were clearly new to the area but were very helpful. We'd definitely book another Headwater holiday. The notes for Day 2 (the section for Isle-sur-la-Sorgue to Fontaine de Vaucluse) are confusing. We think you've got your D25 and D24 mixed up, and perhaps the distances as a result as well. The notes for Day 4 (the section for Roussilon to St Saturnin les Apt) in the paragraph starting 'Continuing on, with the mines...' mentions 'Go straight over the roundabout...) You would only do this if returning back to the roundabout after having taken the 1st exit to go to the shops and the café. If you hadn't taken the 1st exit, but taken the 3rd, you'd be left wondering where the second roundabout was that you were supposed to go straight across! We have been on a few other trips with headwater and this was our least favorite. There are a number of problems with the instructions. The area is not as scenic at the time of year we rode as others. The distances are quite short with little to do once the ride is over. There are things that need to be thought out and tips and pointers given such as availability of taxis to St. Remy and restaurant/store availability. Still a number of bugs that need to be worked out. Excellent route with just the right amount of easy flat cycling and some more strenuous hilly sections. Beautiful part of France with plenty to see and do whilst cycling. Lots of good lunch options too. Another well put together holiday which we thoroughly enjoyed. A really lovely week touring a rural area of Provence. The scenery within the Luberon valley, protected by the two wooded and rocky ridges was delightful, shame we missed the lavender in bloom (late August) but the fruit trees and vineyards were pretty scenic. The grading is fair, one or two climbs to the hillside villages worth it for the views and a welcome cool drink! 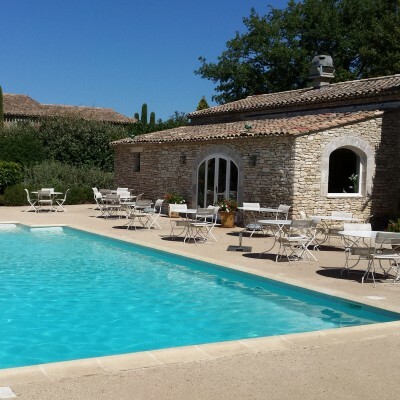 Accommodation on the whole, whilst modest, was acceptable, the highlights being the pool at Les Mas de Senecole and the 'Country Home' lounge at L'Hermitage. Not terribly taken with St Saturnin les Apt as a stop, either as a village and particularly unimpressed with the Hotel St Hubert. Routes well planned on country lanes and bike tracks but still offering interesting stop off points - we loved the Caves at Thouzon, not least for its cool temperatures on a hot day! Great reliable support from reps Laura and Tim. Thank you for taking the time to write in with your post-holiday feedback. It was great to read you enjoyed a lovely week in Provence. We were however sorry to read of your disappointment with Hotel St Hubert. Over the course of the summer, we monitor the feedback we receive from our customers. We then use this feedback to help us to improve our holidays for future customers. With this in mind, we have made the decision to change this hotel for the 2017 season. We are sure you will agree, this will help us continue to enhance this holiday. We were pleased to read you rated our reps support highly. I am sure they were delighted to read your comments. In closing, we would like to thank you for choosing Headwater and look forward to welcoming you on another of our holidays in the future. Great hotels and food - a great trip in a beautiful region..
Cycling was excellent, food good, people friendly and reps also very good ad helpful. A bit disappointed with the accommodation at Hotel St Hubert. Rooms were old and quite shabby. The 'multi-choice' approach to answering disguises the variable nature of the accommodation and cuisine. The route notes (for cycling) were written in almost narrative style and A4 landscape which may be appropriate and helpful to walkers but were cumbersome and awkward to follow for cyclists. Some defences were clearly lifted from walking notes e.g. references to maps not available to cyclists. Every two days from 27th Apr 2019 to 22nd Oct 2019, for 8 nights. All dates are subject to availability, please contact us to check. It is possible to hire electric bikes for this holiday at a supplement of £202 per person. As these are available on a first come first served basis, we recommend early booking to avoid disappointment. It is possible to hire tandem bikes for this holiday at a supplement of £185 per bike. As these are available on a first come first served basis, we recommend early booking to avoid disappointment. Due to the tailor-made nature of our holidays, we need a little more information in order for us to check availability for Landscapes of the Luberon Cycling. Simply complete the form below and a member of our sales team will contact you (when it's most convenient for you) to provide availability information, travel options and an accurate price. Of course there's no obligation, but if you do wish to proceed with a booking they will be on-hand to assist you throughout the process.